For some time the view that the actin cytoskeleton acts primarily as a scaffold, to be assembled in response to a signaling cascade as an end point in the pathway, has prevailed. However, it is now clear that the dynamic nature of the cytoskeleton is linked to downstream signaling events that further modulate cellular activity, and which can determine cell fate. Examples of this lie within the regulation of programmed cell death, the maintenance of homeostasis and the process of cellular ageing. 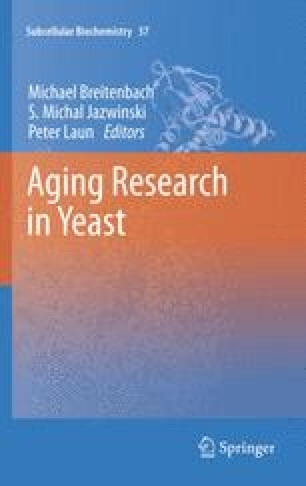 In yeast the actin cytoskeleton has been shown to interact directly with signaling pathways known to be important in the regulation of both ageing and cell death. For example it has been discovered that the level of damage sustained by the actin cytoskeleton under conditions of oxidative stress is directly linked to apoptosis. Further evidence comes from the finding that actin based propulsion mechanisms are required for the inheritance of mitochondria and anti-ageing factors into newly formed cells. In addition to this actin is known to directly influence the formation of protein aggregations. In this chapter we will discuss these points and postulate as to their significance with respect to the maintenance of cellular homeostasis.